The aron kodesh (“holy ark”), where the Torah Scrolls are kept, is situated in the front of the synagogue. In the Sephardic tradition, it is referred to as the heichal (“chamber”). The ark is the holiest place in the synagogue. The ark is opened only during special prayers and when removing the Torah to read during prayer services. It is customary (but not obligatory) to stand when the ark is opened. Since it houses sacred items, the ark itself is considered holy. Thus, an ark may not be modified for non-sacred uses or discarded in a disrespectful manner. In synagogues that are to the west of Jerusalem, the ark is on the eastern wall, so that when we face the ark we are facing the holy city of Jerusalem where the Holy Temple once stood. Traditionally, arks were built into the eastern wall of the synagogue. 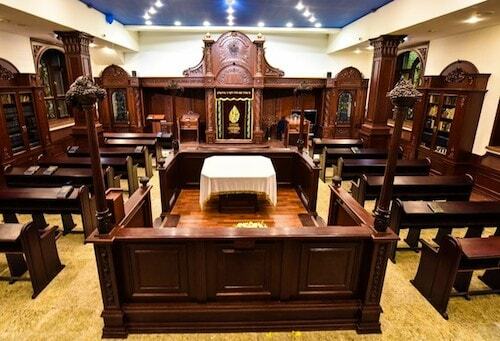 However, freestanding arks are also common, especially in Chabad centers, where the sanctuary may also double as an all-purpose community room. While the ark can be made of any material, the most common seems to be wood. Often the ark has built-in brackets so that the Torah scrolls can be propped up in an almost upright position. Read: Why Do We Face East When Praying? Or Do We? 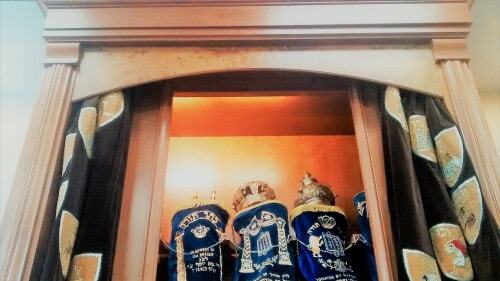 The aron kodesh and/or the parochet are often decorated with words from scripture or the sages that reflect the sanctity of the synagogue or the specialness of the Torah housed therein. 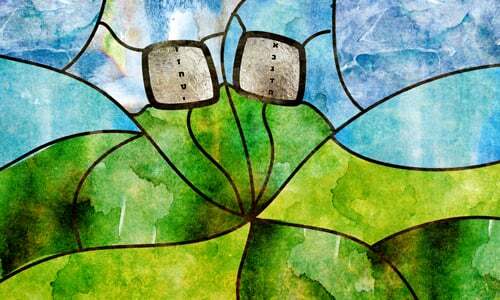 There is much room to decide which verses to display, and synagogues may choose which verses reflect their values or aspirations. It is also common for the names of benefactors or their loved ones to be embossed or embroidered on the ark or the parochet. During the High Holiday season, the curtain for the ark, the covers of the Torah scrolls, and the cloths covering the amud and the bimah are traditionally exchanged for white ones. White represents purity, forgiveness and a clean slate, all central High Holiday themes. In many cases, the holy ark sports an image of the two Tablets that bear the Ten Commandments. Other common motifs include lions, Torahs, crowns and other Judaic imagery. Read: What Did the Tablets Look Like?